Andy Stanley opposes prophesies of Jesus? "...contend earnestly for the faith that was once for all delivered to the saints" (Jude 3). Did mega-Protestant Pastor Andy Stanley really say you should not use Old Testament prophecies to support Jesus’ Messiahship? Did he also claim that there was no Bible until the fourth century? Did he also teach against the Ten Commandments? Did Jesus, Peter, Paul, Apollos, and Philip use Old Testament prophecies to prove that Jesus was the Messiah? Did it really take until the fourth century to have a Bible? Did early Christians teach the observance of the Ten Commandments? Dr. Thiel, who listened to Andy Stanley in a podcast, plus who has studied the Bible and church history, answers these questions from a Christian perspective. 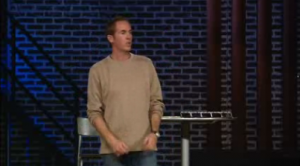 Here is a link to our video: Andy Stanley opposes prophesies of Jesus? The Old Testament Canon This article shows from Catholic accepted writings, that the Old Testament used by non-Roman Catholics and non-Eastern Orthodox churches is the correct version. The New Testament Canon – From the Bible and History This article, shows from the Bible and supporting historical sources, why the early Church knew which books were part of the Bible and which ones were not. Proof Jesus is the Messiah This free book has over 200 Hebrew prophecies were fulfilled by Jesus. Plus, His arrival was consistent with specific prophecies and even Jewish interpretations of prophecy. Marcion: The First Protestant? Considered to have been an organized heretic, he taught against the Old Testament, the law, and the Sabbath. Some have considered him to be the first Protestant reformer. But was he? Here is a link to a related sermon: Marcion: The first Protestant reformer? The Ten Commandments: The Decalogue, Christianity, and the Beast This is a free draft/unedited pdf book explaining the what the Ten Commandments are, where they came from, how early professors of Christ viewed them, and how various ones, including the Beast of Revelation, will oppose them. A related sermon is titled: The Ten Commandments and the Beast of Revelation. Simon Magus, What Did He Teach? Sometimes called “the father early heretics” or the “father of heresies”, do you know what early writers claimed that Simon Magus taught? Sadly, most who profess Christ still hold to versions of his teachings. Here is a link to a related sermon: Simon Magus and ‘Christianity’? Why Be Concerned About False and Heretical Leaders? There have been many false leaders–here is some of why you should be concerned about them. Here is a related article in the Spanish language ¿Por qué estar preocupado acerca de falsos y heréticos líderes? Hope of Salvation: How the Continuing Church of God differ from most Protestants How the real Church of God differs from mainstream/traditional Protestants, is perhaps the question I am asked most by those without a Church of God background. As far as some changes affecting Protestantism, watch the video Charismatic Did The Early Church Teach Millenarianism? Was the millennium (sometimes called chiliasm) taught by early Christians? Who condemned it? Will Jesus literally reign for 1000 years on the earth? Is this time near? Two related sermons are available Millennial Utopia and The Millennium. The Gospel of the Kingdom of God This free online pdf booklet has answers many questions people have about the Gospel of the Kingdom of God and explains why it is the solution to the issues the world is facing. Here are links to three related sermons: The World’s False Gospel, The Gospel of the Kingdom: From the New and Old Testaments, and The Kingdom of God is the Solution. Where is the True Christian Church Today? This free online pdf booklet answers that question and includes 18 proofs, clues, and signs to identify the true vs. false Christian church. Plus 7 proofs, clues, and signs to help identify Laodicean churches. A related sermon is also available: Where is the True Christian Church? Here is a link to the booklet in the Spanish language: ¿Dónde está la verdadera Iglesia cristiana de hoy? Here is a link in the German language: WO IST DIE WAHRE CHRISTLICHE KIRCHE HEUTE? Here is a link in the French language: Où est la vraie Église Chrétienne aujourd’hui? Continuing History of the Church of God This pdf booklet is a historical overview of the true Church of God and some of its main opponents from Acts 2 to the 21st century. Related sermon links include Continuing History of the Church of God: c. 31 to c. 300 A.D. and Continuing History of the Church of God: 4th-16th Centuries and Continuing History of the Church of God: 17th-20th Centuries. The booklet is available in Spanish: Continuación de la Historia de la Iglesia de Dios, German: Kontinuierliche Geschichte der Kirche Gottes, French: L’Histoire Continue de l’Église de Dieu and Ekegusii Omogano Bw’ekanisa Ya Nyasae Egendererete. CCOG.ORG Continuing Church of God The group striving to be most faithful amongst all real Christian groups to the word of God. To see how CCOG has done so far, here are links to two sermons Continuing Church of God (CCOG) first year anniversary: What has been accomplished? and The Continuing Church of God: Two Years of Proclamation. Here is a written link to a version of that sermon in the Spanish language: Aniversario del primer año de la Continuación de la Iglesia de Dios: ¿Qué se ha cumplido? Congregations of the Continuing Church of God This is a listing of congregations and groups of the Continuing Church of God around the world. Continuing Church of God Facebook page This has news and prophetic information. CCOG.ASIA We in the Continuing Church of God also have the url www.ccog.asia which has a focus on Asia and has various articles in Mandarin Chinese as well as some in English, plus some items in other Asian languages. 我们在继续神的教会也提供此网址 www.ccog.asia, 关注于亚洲并且有各种各样的中英文文章，其中一些用菲律宾语翻译的文章也正在进行中，准备添加到这个网站中。 Here is a link to our Statement of Beliefs in Mandarin Chinese 继续神的教会的信仰声明. CCOG.IN This is a website targeted towards those of Indian heritage. It has a link to an edited Hindi translation of The Mystery of the Ages and is expected to have more non-English language materials in the future. CCOG.EU This is a website targeted toward Europe. It has materials in more than one language (currently it has English, Dutch, and Serbian, with links also to Spanish) and it is intended to have additional language materials added. CCOG.NZ This is a website targeted towards New Zealand and others with a British-descended background. CCOGAFRICA.ORG This is a website targeted towards those in Africa. CCOGCANADA.CA This is a website targeted towards those in Canada. CDLIDD.ES La Continuación de la Iglesia de Dios. This is the Spanish language website for the Continuing Church of God. PNIND.PH Patuloy na Iglesya ng Diyos. This is the Philippines website Continuing Church of God. It has information in English and Tagalog. CCOG Animations channel. The Continuing Church of God has some animations to teach aspects of Christian beliefs. Bible News Prophecy channel. Dr. Thiel has produced many YouTube videos for the BibleNewsProphecy channel. And you can find them there. ContinuingCOG channel. Dr. Thiel has produced YouTube video sermons for this channel. Note: Since these are sermon-length, they can take a little longer to load than other YouTube videos. Here is a link to a short intro: ContinuingCOG Channel. CCOGAfrica channel. This has messages from African pastors in African languages such as Kalenjin, Kiswahili, Embu, and Dholuo. BibleNewsProphecy Podcast. This has audio-visual podcasts of the Bible News Prophecy channgel. It plays on i-Phones, i-Pads, and Windows devices that can play i-Tunes. Bible News Prophecy online radio. This is an audio version of the Bible News Prophecy videos. It is also available as a mobile app. This entry was posted on Sunday, August 26th, 2018 at 12:01 am	and is filed under Church History, COG News, Doctrine. Sermon: Old Testament Canon: Who Knew? BibleNewsProphecy: When Was the Exodus? Sermon: CCOG Q&A: Original Order of Bible, Birth Control, Nicolaitans, and More! Your email will not be shared. You may unsubscribe at anytime.